The military dimension of the commercial companies was not limited to the control of colonies and the imposition of monopolies but was also a crucial factor in the transport and control of slave contingents. Despite the innovations introduced by Atlantic slavery (the plantation system, the lack of Ranson mechanisms), rightly pointed out by Adela Fabregas, it is not possible to deny the connection between captivity in the medieval Mediterranean and the Atlantic slave trade. The conquest of Ceuta in 1415 may be seen as a symbolic landmark of the sequence; although this episode laid the foundations for the Portuguese expansion in Atlantic Africa, it is still closely connected with the flow of Mediterranean slaves towards Valencia, where large numbers of captives taken were sold. Antonio de A. Mendes regards this episode as “the first mass deportation of human beings in modern times,” making it clear that this would have been possible without the participation of the Florentine and Genoese mercantile companies. Later, when the Portuguese Crown extended its manhunts to the south, it not only transplanted the slave managing model used in the Maghreb to sub-Saharan Africa but entrusted this task to Italian agents. From 1510 onwards, Dutch financiers also participated in these activities and contributed to redirecting the flow of slaves towards the Atlantic plantations. Mendes’s chapter thus emphasizes the connections between the Portuguese expansion in Morocco, the beginnings of the slave trade in Senegambia and the growing use of slaves in the Atlantic islands with the beginning of the sugar economy around 1525. The fact that commercial companies shared so much with others which were more clearly military in character underlines the idea that all these associations were to some extent based on the Christian discourse on fidelity (fidelitas). 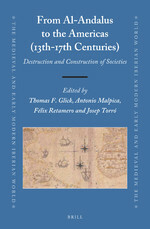 Source: From Al-Andalus to the Americas (13th-17th Centuries) – Destruction and Construction of Societies.